Ronny Mauricio had been hot out of the gate in his first full professional season, but on Sunday, he was boiling. The third-ranked Mets prospect went 4-for-6 with an RBI and a run scored in Class A Columbia's 12-5 rout of Lexington at Whitaker Bank Ballpark. Mauricio's first career four-hit performance extended his hitting streak to eight games. The 18-year-old's hits were all singles, beginning with a leadoff base hit to right field on the first pitch of the game off Royals No. 22 prospect Austin Cox. Mauricio singled to left in the second, and then knocked in Brad Marquez with a soft line drive to left in the fourth. The Dominican Republic native, who is batting .368 this year, has logged a hit in every game since going 0-for-4 on Opening Night. This was his fifth multi-hit game of the season and the 22nd of his career. Mauricio compiled a line of .279/.307/.421 with three homers as a rookie in the Gulf Coast League, his first taste of domestic ball after signing for $2.1 million back in 2017. That was good enough to earn a promotion to the Appalachian League, where he sported a line of .233/.286/.333 in eight games to close out the season. 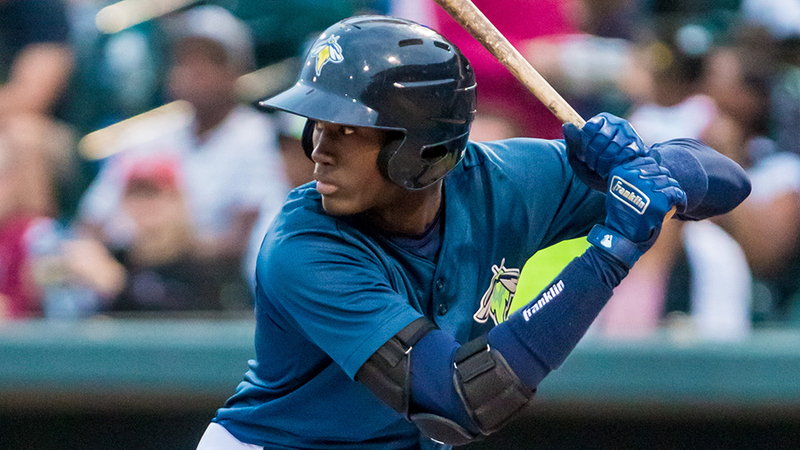 The Fireflies racked up a season-high 18 hits -- two shy of the franchise record -- as every member of the lineup reached base, scored or drove in a run. Fourth-ranked Mets prospect Mark Vientos went 3-for-5 with an RBI and a walk, and Juan Uriarte and Brian Sharp drove in three runs apiece. Right-hander Dedniel Nunez (2-0) allowed three runs on five hits while striking out seven across 5 2/3 innings. Royals No. 13 prospect Michael Gigliotti had two hits and scored once, raising his average to .353 on the season, while Jackson Lueck belted his first homer of 2019. Jordan Wolf is a contributor to MiLB.com. Follow him on Twitter @byjordanwolf. This story was not subject to the approval of the National Association of Professional Baseball Leagues or its clubs.